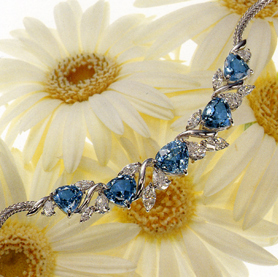 aquamarine has since become known as a gemstone that assures safe travel. Aquamarine was named by the Romans about 2,000 years ago, its name being derived from the Latin aqua, meaning “water,” and marina, meaning “sea.” Said to be a gemstone that protects sailors and guarantees safe voyage, it is also known as one that cools the temper, allowing the water to remain calm and levelheaded. Like emerald, aquamarine is a variety of the mineral beryl, with a hardness of 7 1/2 to 8 on the Mohs scale, which lists diamond as 10. Whereas emerald is colored green by the elements chromium or vanadium, aquamarine’s light blue is caused by traces (0.5 – 2.0 %) of iron. Though both are the same mineral, emerald is vulnerable to shock, while aquamarine has excellent durability. Aquamarine also shows a more even distribution of color throughout the stone and a characteristically high level of transparency. Aquamarine is a gem that is loved by many for its crisp, clean appearance. The pure blue with a tone level of 3 seen in the photograph on the next page can be considered ideal. A random survey (300 persons: 150 men, 150 women) showed that women especially seem to prefer a level 3 over a level 3 . It is likely that for them a lighter blue conveys a softer, more tranquil feeling. Because its color suggests coolness, it is a gem that is often worn in the spring and summer. Most aquamarines are faced as emerald, oval, and pear shapes. A gem-quality aquamarine like that in the photograph is far more beautiful and valuable than a ruby or sapphire of accessory quality.